Can I Bread Chicken Breasts With Just Flour & Seasonings? Make things simple by coating your chicken breasts in just flour and seasonings. 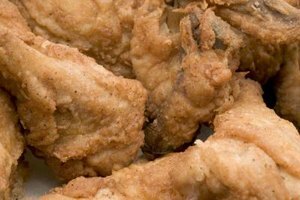 1 Can I Coat Chicken Wings in Cornstarch Before Deep-Frying? All you need to create some crispy pan-fried or deep-fried chicken breasts is flour and seasonings. While this simple mixture will not create an optimal crust for baked chicken, these basic ingredients are just what you need to create a crunchy coating on fried chicken. Season well and dredge your chicken breasts for a quick and comforting weeknight dinner. To create flavorful pan-fried chicken breasts, you simply need seasonings and flour. Season the meat with a blend of salt, pepper, garlic powder and other favorite seasonings. If you like things a little spicy, throw in some cayenne. Pour flour in a small bowl and dip the chicken breasts in the flour, thoroughly coating all sides. Arrange on a plate until all pieces are dredged. Heat an inch of oil in a frying pan and cook the breasts for 10 minutes on each side or until crisp and browned. Flip the breasts just once while cooking. Check the internal temperature is 165 degrees Fahrenheit using a thermometer. To prepare chicken breasts for deep frying, season them well with salt, pepper and any other seasonings you like. Dredge them in flour and arrange them in a single layer on a plate. Heat several cups of oil in a deep pot over a medium-high heat until a sprinkle of flour quickly sizzles and disappears. Add the chicken breasts and cook until they are crisp, brown and all juices run clear. Drain the breasts on a couple of layers of paper towels before serving to remove excess oil. Cook to an internal temperature of 165 F.
To create even crunchier chicken breasts with a thicker coating, you can double dip the chicken breasts when breading them. Season and dredge your breasts as usual. Put some water in another bowl and dip each dredged breast in it. Quickly remove the breast, shaking off excess water and dip it in the flour mixture again. Roll the breast firmly in the mixture so plenty of flour sticks. Set the breasts aside in a single layer on a plate until all are complete and pan fry or deep fry. Make sure the internal temperature reaches 165 F.
To make breaded chicken breasts in the oven, you will need a couple more ingredients to ensure a nicely browned and crunchy exterior. Oven-baked chicken breasts coated with only flour will lack a crisp coating. To create a crunchy coating, season the chicken breasts and dredge in flour. Then dip the breasts in a beaten egg-water mixture and roll in panko breadcrumbs or regular breadcrumbs. Lay the chicken breasts flat on a baking sheet and cook until browned and juices run clear. Flip once while baking. Check the temperature reaches 165 F before serving. Can You Bread Chicken Wings With Egg Wash & Flour? Does Cornstarch Make Fried Chicken Coating Lighter?